April 1 (Bloomberg) — U.S. stocks advanced for a second day as sales of existing homes unexpectedly increased and a manufacturing gauge topped economists’ estimates, bolstering optimism that the worst of the recession is over. The dollar strengthened against the euro and oil fell. D.R. Horton Inc. led gains in 12 of 13 shares in an index of homebuilders as the National Association of Realtors reported a 2.1 percent increase in pending home resales in February. Citigroup Inc. and JPMorgan Chase & Co. added at least 5.8 percent after Treasury Secretary Timothy Geithner said there are signs that financial markets are recovering. The Standard & Poor’s 500 Index rose 1.7 percent to 811.08 a day after capping its best monthly rally since 2002. 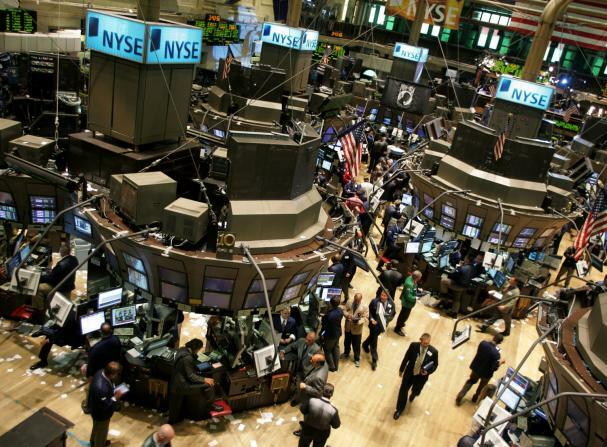 The Dow Jones Industrial Averageincreased 152.68 points, or 2 percent, to 7,761.6. The MSCI World Index of 23 developed nations added 1.7 percent, with Ireland and Denmark posting gains of more than 4 percent to lead the advance. U.S. stocks rose yesterday, giving the S&P 500 an 8.5 percent advance in March, as investors bought the month’s best- performing companies. The S&P 500 has climbed 20 percent since March 9, trimming its 2009 decline to 10 percent, as banks from Citigroup to Bank of America Corp. said they made money in the first two months of 2009 and Geithner unveiled plans to rid financial firms of toxic assets. D.R. Horton rallied 4.4 percent as a gauge of homebuilders across S&P indexes posted its first gain in four days. Economists project the housing downturn may ease further as efforts to thaw credit and offer tax breaks to first-time buyers begin to take hold and foreclosure-driven declines in prices and lower mortgage rates lure more buyers. Centex Corp., the second-largest U.S. homebuilder by sales, rose 2.9 percent to $7.72. KB Home, the fourth-largest, gained 2.8 percent to $13.55. Citigroup, which has received about $45 billion in U.S. bailout funds, rose 5.9 percent to $2.68 for the second biggest gain in the Dow industrial averageafter American Express Co. JPMorgan, the largest U.S. bank by market value, climbed 5.9 percent to $28.14. Geithner said in a Bloomberg Television interview that financial markets appeared to be recovering and praised international efforts to counter the economic crisis. The euro traded near a two-week low against the dollar and pound after a report showed Europe’s jobless rate climbed in February to the highest in almost three years as Group of 20 leaders prepared to meet in London. Mexico’s peso was one of the biggest gainers versus the dollar among major currencies after the government said it will seek a $47 billion credit line from the International Monetary Fund. The euro plunged 5.2 percent in the first quarter on concern banking losses in eastern Europe will deepen the recession in the 16 nations using the common currency. The European currency fell 0.1 percent to $1.3231 at 4:01 p.m. in New York, from $1.3250 yesterday. It touched $1.3114 on March 30, the lowest level since March 18. The euro was at 130.55 yen, compared with 131.13. Against the pound, the euro depreciated 1 percent to 91.66 pence after touching 91.55, the lowest level since March 16. Japan’s yen was at 98.67 per dollar, compared with 98.96. It earlier declined to 99.47, the weakest level since March 5. The euro region’s jobless rate increased in February to 8.5 percent, the highest level since May 2006, the European Union’s statistics office said in Luxembourg today. The median forecast of 23 economists surveyed by Bloomberg was 8.3 percent. Crude oil fell after a government report showed that U.S. oil stockpiles rose to a 15-year high and gasoline supplies unexpectedly increased as the recession curbed fuel demand. Crude-oil inventories climbed 2.84 million barrels to 359.4 million in the week ended March 27, the highest since July 1993, the Energy Department said today. A 3 million-barrel increase was forecast, according to a Bloomberg News survey. Gasoline supplies rose by 2.23 million barrels to 216.8 million. Crude oil for May delivery fell $1.27, or 2.6 percent, to $48.39 a barrel at 2:48 p.m. on the New York Mercantile Exchange, the lowest settlement since March 18. Prices are up 8.5 percent this year and have dropped 67 percent from a record $147.27 a barrel in July. Copper rebounded in New York after today’s economic reports eased concern that the recession may deepen. “We have had some little signs of hope,” said William O’Neill, a partner at Logic Advisors in Upper Saddle River, New Jersey. Copper futures for May delivery rose 0.45 cent, or 0.2 percent, to $1.849 a pound on the New York Mercantile Exchange’s Comex division. Earlier, the metal lost as much as 2.6 percent.